One of the challenges for kids (of all ages) is making sure to eat enough green foods. Leafy green vegetables and herbs are among the most powerful and beneficial foods for overall health and wellness. We don’t have to look far in nature to see the benefits of eating plenty of greens. Our closest genetic relatives are chimpanzees and gorillas. Chimps eat about 60% of their diet in greens. Gorillas are at about 80%. Both species are pound for pound much, much stronger than humans. The trick for most of us, including children, is getting enough greens in our diets. I personally like to use green superfood powders in addition to drinking plenty of fresh green juices and eating salads. The green powders combined with the juices are concentrated and nutrient dense, yet small enough to eat in relatively large quantities. But for many people salads, juices and green smoothies can get somewhat boring. 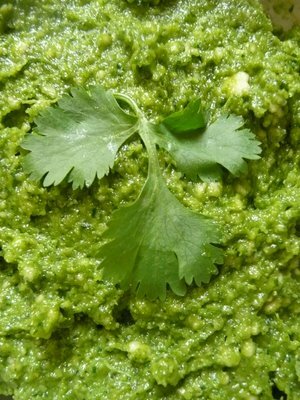 If that’s the case I like to mix leafy greens into savory dishes like pates, living food lasgna, raw food crackers and, my all time favorite: super green pesto. I’m really happy to report that everyone in my family, including my small daughter, loves the pesto I make. It only takes 15 minutes to create and keeps for a couple of weeks. For the kids, it’s also high in calories and good fats, plus all the goodness of the greens. Wash all the greens and place them in the bottom of the blender. Add all the other ingredients except the nuts and blend until you arrive at a liquid consistency. Next add the nuts and blend until they are well incorporated. My little one loves this on celery or packed inside of cherry tomatoes. I love pesto wrapped up in a nori sheet with even more greens on it.